• Specially Formulated Instantized Milk Replacer For Lambs. • Helps Decreased Lactose Levels. • Mixes Easily and Stays In Suspension. • Mix 4 Ounces Of Milk Replacer Powder With 1 Pint Of Water At 110 F.
• Nutritionally Complete Medicated Milk Replacer For Goat Kids. • Specially Formulated For Warm Bottle-Feeding Or Cold Ad Lib Feeding. • 100% Instantized For Easy Mixing. Works Very Well With Automated Feeding Devices. • Premium Quality Milk Replacer Formulated For Lean Growth In Kids. • Mix 4 Ounces Of Powder Into 1.5 Pints Warm Water and Feed As Directed Based On Body Weight. • Universal Milk Replacer, Exclusive Magic Crystal Technology Produces The Best Mixing Product On The Market Today. • Multi-Purpose All Milk Protein Nursing Formula. • For Use In Calves, Foals, Goat Kids, Lambs, Baby Pigs, Fawns, Elk Calves, Llama Crias, Puppies and Kittens. • Supplement For Horses, Cattle, Pigs, Goats, Rabbits, Swine, Poultry, Deer and Elk. • Calf-Manna Is A Supplement and Should Be Fed Along With The Daily Ration. • Promotes Rapid Absorption Of Important Vitamins and Minerals. • Quickly Replenishes Electrolytes In Scouring and Dehydrating Goats. • Feeding Temperature Of The Solution Should Be At Or Near Body Temperature (90O-100O F). • Offer The Solution At A Rate Of Cup For Each 6 Pounds Of Body. • Suitable For Use For Calves, Foals, Goat Kids, Pigs and Puppies, This Range Allows You To Keep One Product In Your Barn. • Uni-Milk Is An Instantized Powder, That Mixes Easily, and Stays In Suspension With No Clumps. • Calves: Mix 8 Level Measures Of Uni-Milk Into 2 Quarts Of Warm Water. • Foals: Mix 4 Level Measures Of Uni-Milk Into 1 Quart Of Warm Water. • Nurse-All Provides The Ultimate In Multi-Species Application, Labeled For 11 Species Of Farm Animals and Pets. • By Formulating This Product At 24% Protein and 24% Fat, It Is Able To Deliver Fast Healthy Growth For Your Animals. • Mixing Directions Using The Enclosed Scoop*, Measure The Amount Of Nurse-All Powder and Mix With Warm Water (115-120 F). • Fortified With Vitamins and Minerals For Sound Growth. • Fosters Optimum Conditions For Reproduction and Enhances Show Appearance. • If Goat Mineral Is Offered Free Choice, Daily Consumption Must Be Monitored and The Location Of The Mineral Feeder Managed. • Instantized Milk Replacer For Goat Kids. • A Cup* Is Provided In Each Kid Milk Replacer Bag. • Mix One Enclose Cup Of Kid Milk Replacer Powder Into 1 Pints Of Warm (110O F) Water. • The Following Amounts Of Reconstituted Milk Replacer Should Be Fed Daily, As Indicated By The Chart. • Multi Species Soluble Powder Electrolyte Supplement That Assists Many Animals In Retaining Essential Body Fluids. • Mix Powder To Warm Water and Stir To Dissolve Completely. • A Comprehensive Supplement For Goats. • Contains Quality Ingredients To Boost and Balance All Types Of Goat Diets. • Helps Meet The Nutritional Needs For Growth, Milk Production, Reproduction and Show Appearance. • Highly Palatable Formula Helps Promote Feed Intake. • Provides Readily Utilizable Energy In The Form Of Dextrose To Help Warm Sick Animals. • Ideal For Farm Stores, Hobby Farmers, Breeders, and Wild Life Rehabilitators. • Versatile Product That Is Safe and Effective For Many Species. • Non-Medicated Formula Requires No Withdrawal Period. • A Multi Species Supplement That Provides Colostrums Fortified With Vitamins and Minerals For Young Animals. • For Calves, Foals, Goat Kids, Lambs, Fawns, Elk Calves, Baby Pigs and Puppies. • Mix 1 Bag With 2 Quarts Warm Water. • Bottle Feed 2 Quarts Solution As Soon As Possible Following Birth. • Feed An Additional 2 Quarts 1-2 Times In The First 24 Hours Of Life. Note: This product is restricted to NM, SD. • Supports A Consistent and Proactive Approach To Biosecurity. • Electrolyte and Energy Supplement For Calves; Horses & Foals;Sheep & Lambs; Goats & Kids; Llamas, Alpacas & Crias; Fawns. • Mix One Enclosed Cup (6 Ounces) Of Dry Powder Into 2 Quarts Of Lukewarm To Warm Water. • Feed As Directed On Label For Each Individual Species. • An Important Part Of Your Newborn Kids Nutritional Regimen. • Mix 2 Enclosed Scoops* Of Kid Colostrum Supplement Powder Into 1 Cup Of Warm Water. • Bottle-Feed To Cups Of Solution Every 4 Hours For The First 24 Hours Of Life. • For Pygmy Goats, Feed About Half Of This Amount Every 3 To 4 Hours For The First 24. • Makes 45 One Gallon Servings Simply Mix With Water! For multi-species pigs sheep llamas rabbits poultry. 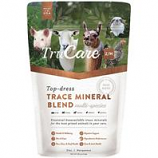 Made with Zinpro Performance Minerals® TruCare Z/M delivers the bioavailability and absorption required from trace minerals.. Benefits Include: Health and wellbeing skin health and wound healing coat and feather quality paw claw and hoof health d. Also beneficial for reproductive performance and bone and joint health. .